Have you ever noticed something at work and thought, “Well, that doesn’t look safe”? Maybe you found the narcotic cupboard unlocked, or saw that the crash cart wasn’t prepped correctly, or spotted dirty equipment in the same storage room as the clean equipment. Thankfully, no one was hurt and the hazard was taken care of immediately. We all know that things aren’t going to be perfect all the time. However, when the same hazards seem to occur over and over, there might be larger issues that could be identified and addressed. To help support this process, BCPSLS has launched new hazard classification options and a revised reporter form that will improve data accuracy and provide more meaningful, detailed information about the hazards you encounter that could potentially impact patients, visitors, or staff. What is a hazard, anyway? And how is it different from a patient safety event? It can sometimes be challenging to determine which form to use to report concerns in PSLS. 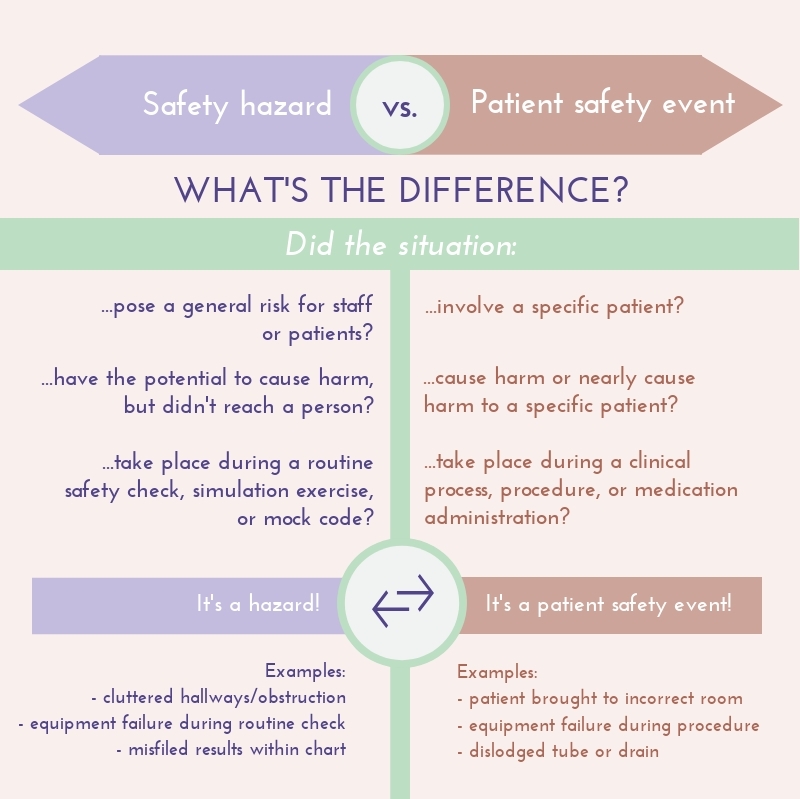 The main difference between safety hazards and patient safety events is that a hazard has not yet reached a person. Hazards create risks and have the potential to affect the safety of anyone—patients, staff, or visitors. Hazards may also threaten our ability to provide optimal care. The new hazard report form is designed for staff to identify situations that have the potential to cause harm or property damage, but have not affected anyone or caused any harm. This means that no patient information is needed to report a hazard! If an event has involved a patient, it should be reported as a patient safety event even if it was a near miss or caused no harm to the patient. The tool below can help you determine if the item you’re reporting is a hazard or a patient safety event. Please feel free to click on the image to download and print a copy for your area. And after you’ve reviewed the tool, test your knowledge with our two-minute Safety Hazard Quiz for a chance to win a $50 gift card! Over the last year, quality assurance reviews of BCPSLS data revealed that requirements for hazard reporting were unclear. As a result, the hazard report form was sometimes being used to report patient safety events and near misses, and the patient safety event report forms were sometimes used to report hazards. It was also clear that more details about hazards were needed in order to create comprehensive reports that could spark action and improvement. To determine the best way forward, BCPSLS engaged two Douglas College Health Information Management (HIM) students to review hazard data and explore an expanded hazard taxonomy during their five-week practicum at Central Office last spring. The newly revised form and fields build on the work the students began—to capture and accurately classify the types of hazards typically reported in PSLS—while still respecting the overall World Health Organization data structure used by BCPSLS. The new hazard form will also enable people to report certain hazards that previously they could only report as patient safety events. In addition, the taxonomy now includes a detailed list of medical device reprocessing and sterilization hazards. Using the new set-up, the Central Office team will be reviewing and reclassifying existing safety hazard data to enable the creation of more comprehensive and accurate aggregate hazard reports. To help triage reports and take quick action on those that pose the greatest risks, a new question has been added to ask reporters if the hazard is likely to cause severe harm if not addressed. The revised hazard report form will also enable staff to flag issues that are identified during simulation, mock codes, and other training exercises. To ensure that the new taxonomy would support the reporting of these types of hazards, BCPSLS Central Office connected with Darin Abbey, Director of the Centre for Interprofessional Clinical Simulation Learning in Island Health. Tammy and the Central Office team will continue to monitor how hazards are reported and followed-up to ensure the new form and taxonomy are working well. Your feedback is welcome, too, as always! Safety Hazard data reports reflecting the new taxonomy will be available in the coming months, enabling programs to see where the greatest risks are so they can address them before anyone gets hurt. Staff are reminded to continue to report staff injuries and exposures to the Workplace Health Call Centre at 1-866-922-9464, not in BCPSLS. Enjoyed the story? Subscribe to our mailing list and never miss a blog post!